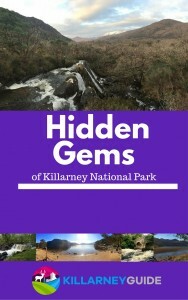 A quick guide to 5 easy walks in Killarney National Park under 5km that are within 5km distance of Killarney town centre. The Circular Walk in the Knockreer area of Killarney National Park is an ideal way to experience the Park without venturing too far from town. The Old Kenmare Road is a superb trail that cuts through Killarney National Park as part of the Kerry Way long distance trail. It is a magical experience that takes you back in time and back to nature. Strickeen : The most accessible of all the peaks of the McGillycuddy Reeks mountain range. The Old Weir Bridge is one of Killarney’s oldest structures and it has seen thousands of visitors pass over and under its famous arches for centuries. Make sure to experience the magical setting of the Old Weir Bridge in Killarney National Park. Torc mountain - home to the famous waterfall of the same name. The path to the summit rewards moderate effort with superb views of Killarney National Park. On Ross Island, copper has been mined for thousands of years. Today, no copper ore remains but a wonderful trail through the island now takes its place. The Governor's Rock is a panoramic cliff top viewing point on the shores of Lough Leane on Ross Island, Killarney National Park. Enjoy this 5 mile route of paved paths around Knockreer and Ross Castle in Killarney National Park. 8 kilometres through woods and parkland and along lakeshore and riverbank. A Hidden Gem of Killarney National Park - Tower Wood Waterfall. A short stroll to a magnificent waterfall, hidden in the oak forests of Killarney National Park. A special trail around Muckross Pensinsula through Reenadinna Woods. Quiet lakeshore paths, hidden parkland tracks and dark mossy woods. The Knockreer and Ross Island Loop in Killarney National Park is a superb 10km route close to Killarney town. Whether you are a runner, cyclist, hiker or a stroller, the route has something for everyone with stunning views, historic sites and nature at its finest. Killegy Woods loop - a charming 5km trail on the edge of Killarney National Park. A short walk around Muckross Abbey, Killarney National Park. Explore medieval ruins, lakeshore trails and woodland river paths. Escape to Derrycunnihy Cascade in Killarney National Park. A trail of two lakes. A 6km looped route through Muckross, Killarney National Park. An alternative route through the Muckross Estate along the shores of two of Killarney's famed Lakes. The Blue Pool - a stone's throw from one of the busiest tourist routes in the Killarney area is a lovely trail that is perfect for a lively walk or an interesting trail run.